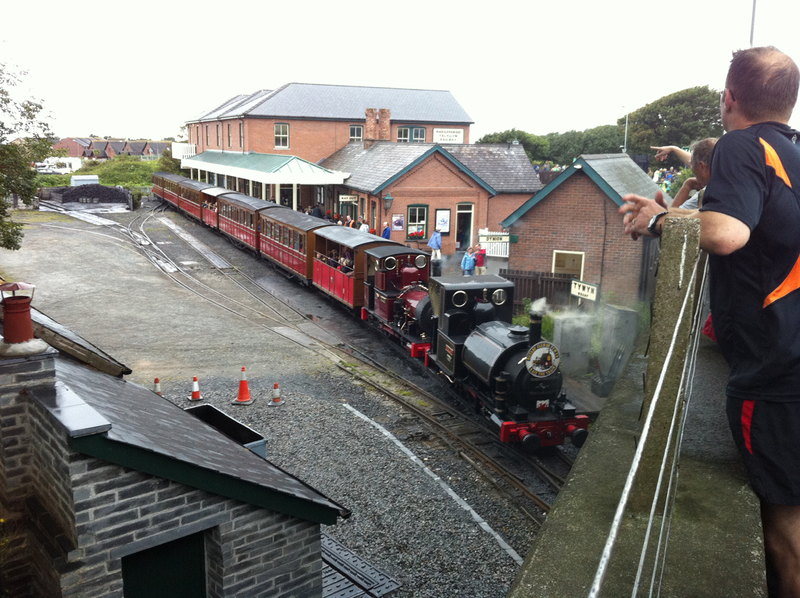 I travelled up to Wales this last weekend with the family to take part in the 28th Annual Race the Train event in Tywyn, Wales. 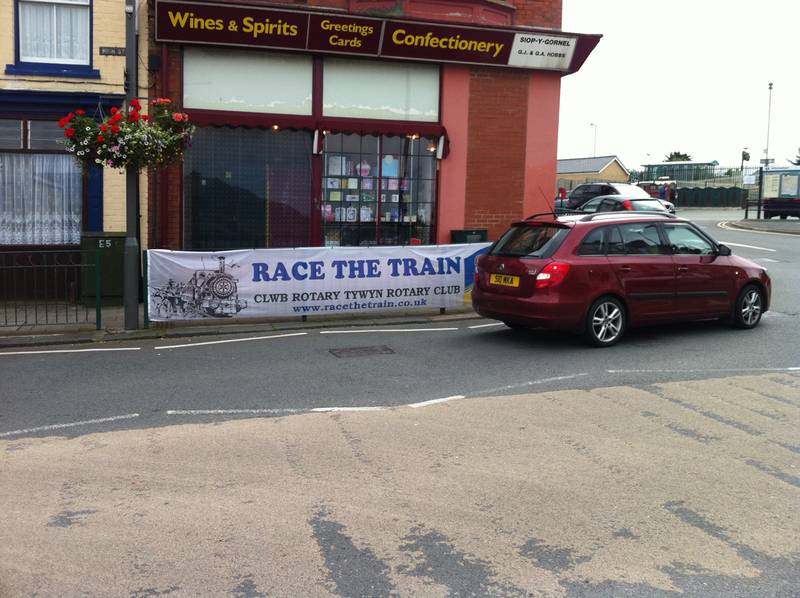 The event is a multi-terrain run where competitors attempt to complete a 14 mile mainly off-road run against an old steam train which follows the runners from Tywyn Station to Abergynolwn and back. The runners will cover a mixture of road (start and end) and then paths, lanes, tracks and agricultural land on an outward 7 mile leg before turning and taking a similar (although slightly more difficult) route back. The train track runs close to the runners and sometimes right next to them. We travelled up on the Friday having decided to make a weekend of it and went to the race registration to collect the spectator train tickets (wife and daughter had come to watch and support). 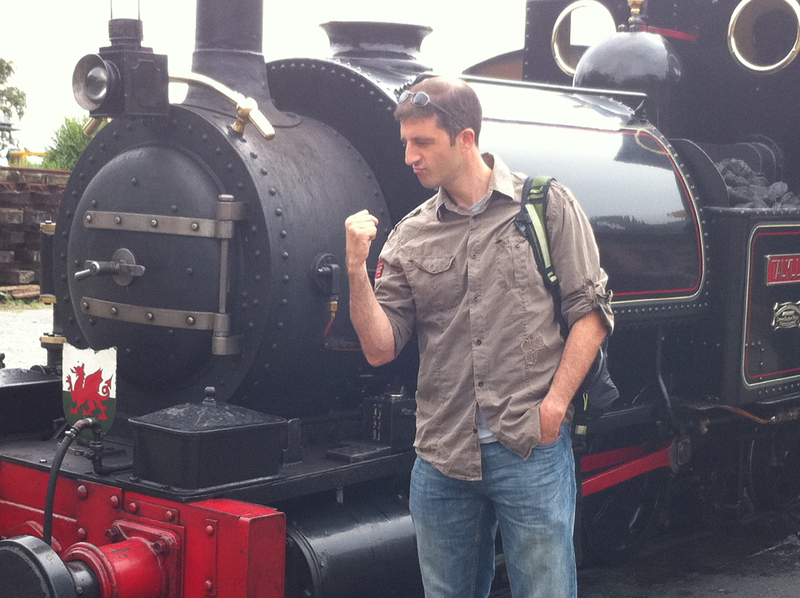 We then visited the small train station with the steam train and I had my first face to face with the train. I hadn’t taken part in the event before and had visions of a huge grand old steam train packed with hundreds of people following a full sized rail track alongside some gorgeous scenic landscapes and rolling hills and a lovely bright summers day. Well, I must admit I was slightly disappointed that the train wasn’t as big as I had expected and the railway station and track was not quite as grand as I expected and the gorgeous scenic landscape was going to be wet, muddy and boggy but we’ll come on to that later. We returned mid-morning the next day to rain, plenty of rain. 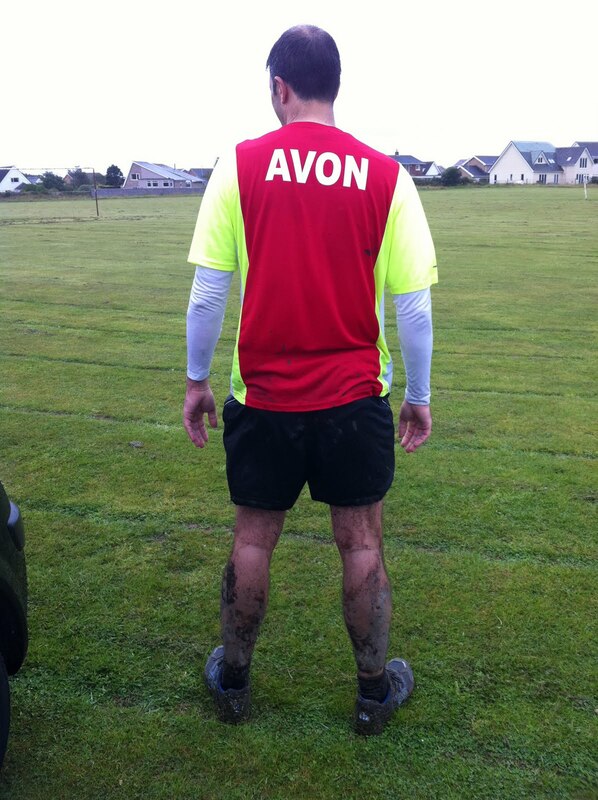 As we drove into Tywyn, the 10k event was underway and we witnessed soaked, filthy muddy runners running back into the town. This didn’t bode too well for the run. This event must be a major highlight in the town as there were plenty of banners and posters upon display in shops around the area. The major road through the town was closed for the run as this would be the start and finish of the run itself and despite the downpour there were plenty of spectators, marshals and supporters out. I left the girls to board the train and waited on the bridge overlooking the station and took a few snaps and tasted the acrid smell of the steam coming from the train. 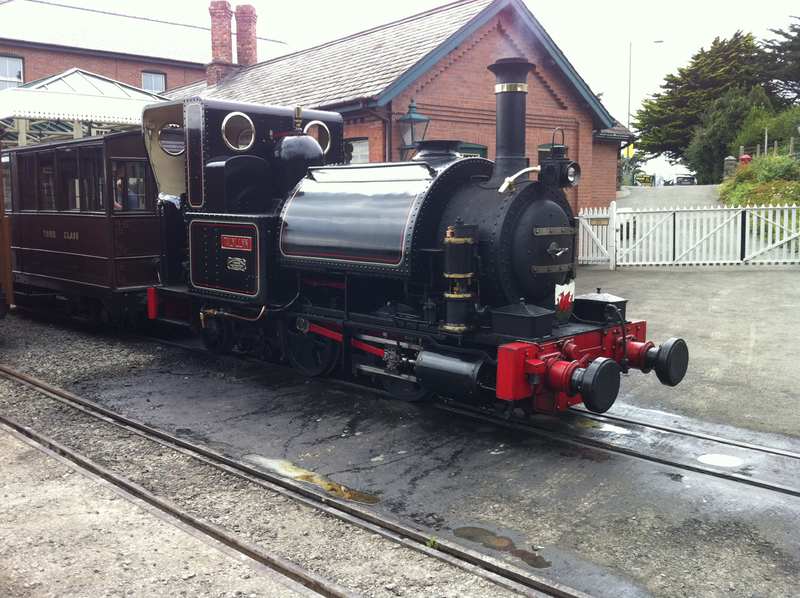 The train was expected to take 1hr 45mins and the course was 14 miles. However, accounting for the varied train it had been suggested that an accurate assessment of your time would be your Half Marathon time plus 25 mins, making mine around 2 hours. So the pre-race prediction was a 15 minute win for the train which pleased daughter no end. As a passenger on the train, she really wanted a train win! 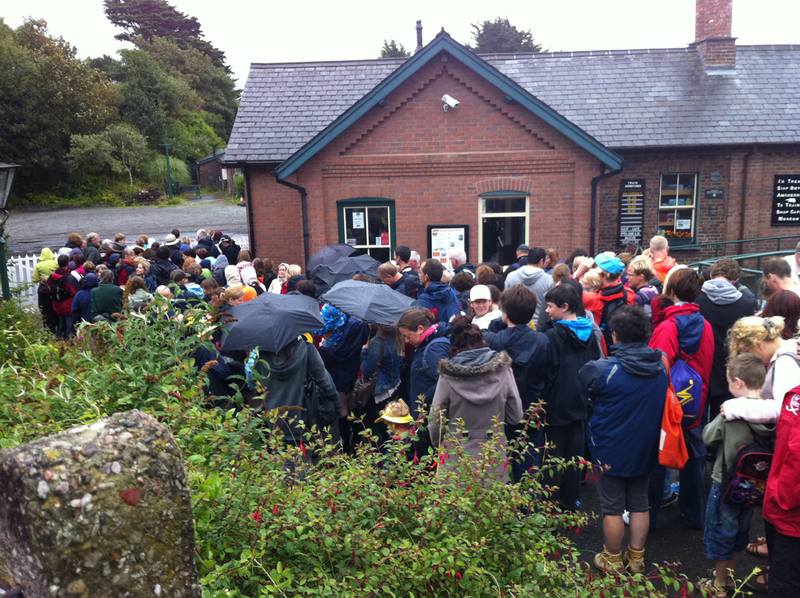 The rain eased up slightly just before the start and at 2.05pm the train sounded its horn as the runners set off. The pre-race plan had been to aim for 1.45 and I had a pre-race plan of doing 7.15 on the outward leg and 7.45 on the way back which would give me a 1.45 finish. It was a hopeful long shot but you’ve got to give it a go, haven’t you. My realistic assessment was a 2 hr finish. Unfortunately, the Garmin decided to die and I had no means to track my pace and had to rely on instinct. I decided to just run and it I was out of breath I was too quick. 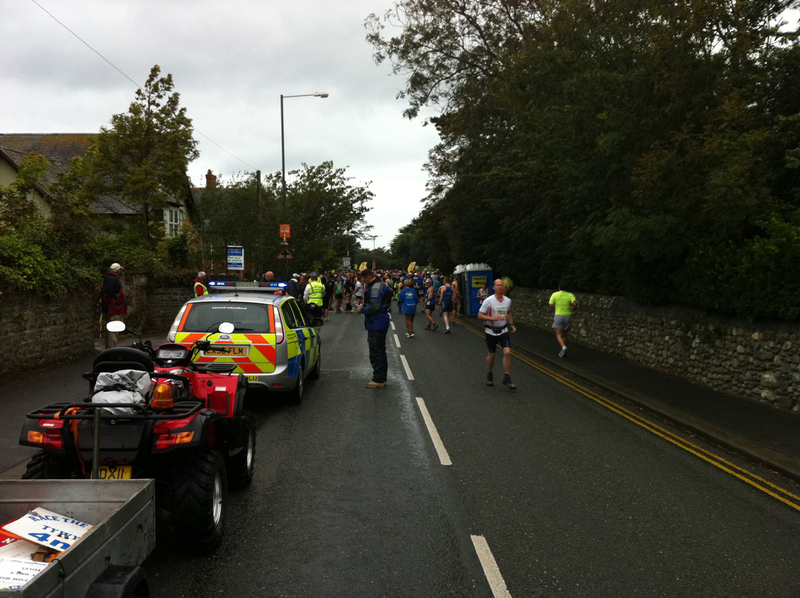 I started in the middle of the pack as several hundred runners gave a cheer and set off. I was conscious not to go too quickly and started to ease past the runners ahead of me and settled into a comfortable rhythm. We headed out of the town, along a road for about a mile and then turned up a farm drive and onto some paths and tracks. The next minor annoyance to befall me was one of the safety pins on my number came away leaving my race number flapping across my chest. I did my best to ignore it and carried on until my bladder felt too full and I had to stop for a quick toilet break in a bush just before mile 2. 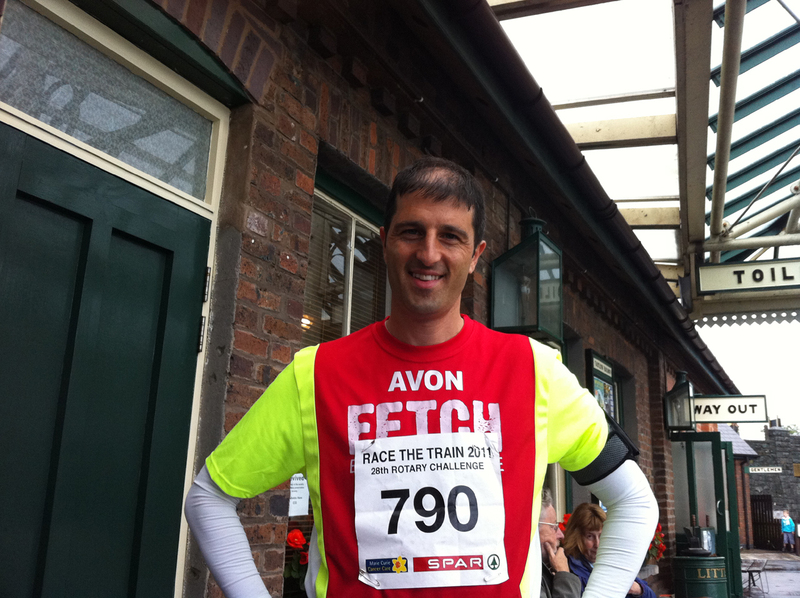 Unfortunately, I had been wearing my Fetch top with name emblazoned across the back so there was no escaping the fact that it was me stopping for a toilet break about 15 mins into the race. It seemed to be drizzling constantly as we splashed through a small ford which soaked your shoes completely and headed up a hilly field and then down a slope. The camber on the hill felt awkward with your right leg striking the ground a couple of inches higher than the left leg, it just felt really uncomfortable. The route you followed wasn’t a proper path but a single line of runners formed stretched out into the distance. I could feel my right calf aching from the awkward hill part and told myself not to worry as the left calf would be aching on the way back. I was running at a reasonable pace but knew this probably wasn’t max effort as my breathing was too comfortable. A runner ahead of me managed to nick himself on a barbed wire fence but carried on regardless. 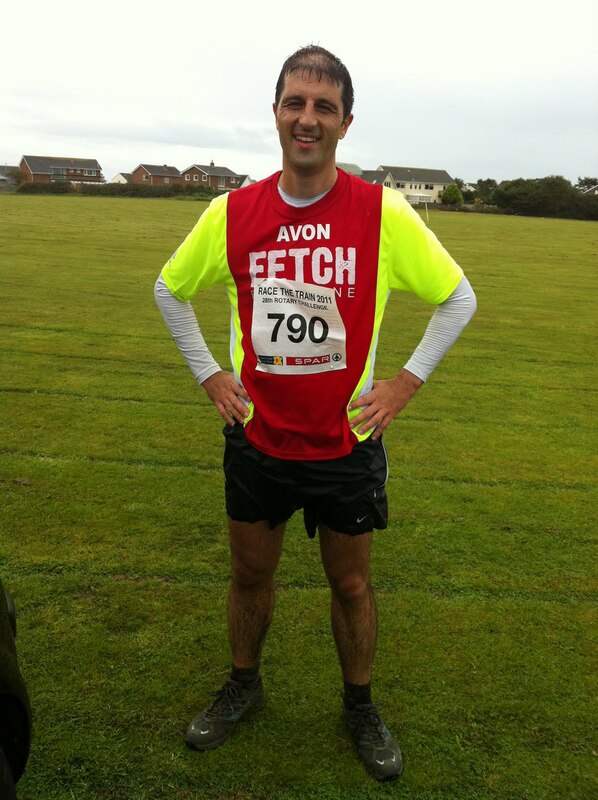 I spoke to a fellow Fetchie in a black Peel Running Top (Run Forest Run I think, hello!) and we managed to leap frog each other a couple of times during the race and exchanged a few words each time. I saw a plume of smoke from the train early on and heard to toot of its horn but didn’t see the train at all for the first half of the race which I hoped meant I was ahead of it. The first half of the course was the easy leg and I had expected a tougher second half as I approached the turn marking the end of the first leg. I popped a carb gel and grabbed some water as I passed the halfway mark and one of the marshals called out “You’re ahead of the train”. Well that was good news, perhaps I’m doing on track after all… and then you hit the return leg. The train does stop for about 20 minutes as it refuels so I guess the train ha arrived but hadn’t yet started the return leg. The first part of the run back was an incline up a sloping hillside and narrow sheep tracks where there was room for one person only and no real opportunity to overtake. As soon as you got to the top of the hill you could feel the full force of the rain and wind battering straight into your face, nice. The conditions from here weren’t great for running, the rain had made the paths slippy, muddy and boggy and areas of the run occurred on loose stones. In addition, there was little opportunity in parts to overtake the whole run felt a little uncomfortable and “constrained” but I guess that’s part of the challenge. At about mile 8 or 9 the track path was muddy and slick and was dangerously closed to a barbed wire fence which had been pushed over to one side but one slip could easily see you fall into it and so I ran face down trying to find a good footing as I carried on. The route back is on an upper part of the hill and at one point I glanced to my right to view the surroundings but managed to stumble as I slipped on something and nearly fell. I learned my lesson there and didn’t look away from the path in front of me after that point for fear of falling. I passed another Fetchie on the way and gave a quick “keep going” but didn’t really see who it was. Just after mile 9, I heard the sound of the train behind us and lots of cheering as the spectators on the train were encouraging the runners. I heard a shout from the wife but couldn’t really give them a wave as I was carefully navigating a particularly slippy area of the path. I felt the pace of the runners around me increase (we were still in a line) in a vain attempt to match the train but I knew the race had ended for us just there. Well that was it, the train had overtaken us and there were 5 miles to go so little chance of catching up and overtaking it. We passed a couple of really boggy areas where I just strode straight through the mud, trying to step lightly so I wouldn’t lose a shoe. I was soaked and my shins were covered in mud at this point thinking this felt like the “Tough Guy” event. We also hit a couple of sharp inclines including some steps which I walked up and then settled back into a run on the downward parts. One slope of the hill was really awkward to run as the left part of my shoe was digging into my ankle due to the camber on the hill, that was probably the most uncomfortable part of the run just there it was enough to make forget running and stride up the hill as comfortably as I could. As you got to mile 10 or 11, the route joins the same path as the outward leg which meant another run through the ford and soaking wet shoes again and after another up and down over the a small raise and then back onto the farm drive before coming out to the outskirts of town. Ahead of me around this point another runner fell to the ground after losing his footing but a runner behind kindly paused to help him up, I’d imagine there had been quite a few slips and trips today. As an aside, I noticed the tops of my legs were frothing I guess as the cold rain hit my warmer legs, I’d never really noticed that before on a run. I had absolutely no idea of the time at all during the run but continued on. I noticed a few people were starting to flag a little as I was slowly drifting past the odd runner. We exited the lane and onto the road only a mile or so to go. 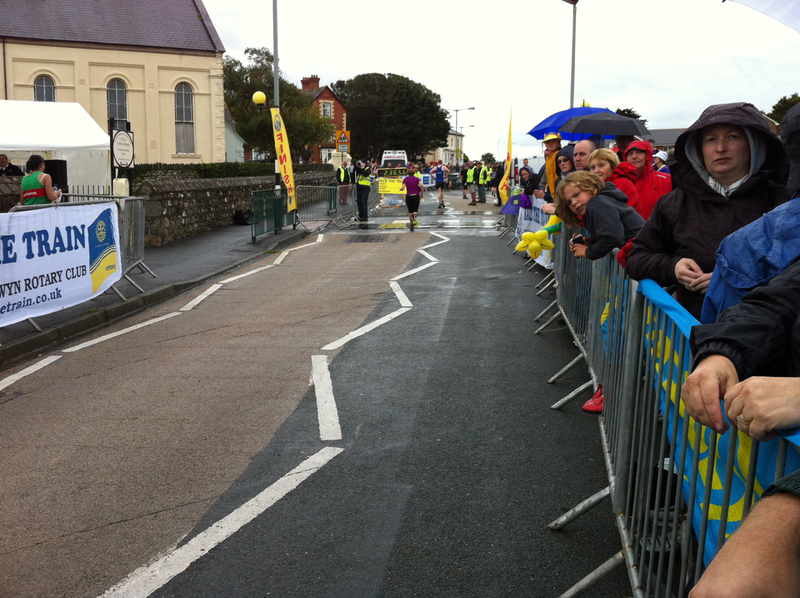 I ran through the outskirts of Tywyn heading to the finish line and then as we turned the corner I saw the glimpse of the finish line and clock which read 1.59 something. My pre-race prediction was 2 hrs and suddenly I put in a bit of a spurt for the last 50-100 yards to finish in 1.59.30 (although my chip time was 1.59.07) and got a few cheers for my effort at the end (the crowd always loves the sprint finish). Sal and Annabelle had already arrived at the station on the train in 1.47.48 and had made the short walk to see me at the end, so they had finished comfortably ahead of me but this did give Sal the opportunity to video my sprint finish. I picked up the train shaped medal and goody bag which included a really good T-Shirt (good quality with a decent logo in the style of a “SuperDry” T-Shirt with the curly writing) and we walked back to the car where I had a shower and got changed. The shower had reminded me of the old football days where there were too many bodies, not enough water pressure to work all the showers at once so the water came out in a dribble and it was scalding hot. I did my best to wash the dirt and grit off myself before we headed back to watch a few other finishers before getting some well deserved fish and chips. The girls had enjoyed the train ride and the time had flown by for them but they did pack a lot of people onto the train so it wasn’t the most comfortable of rides. The support on the race by the marshals and locals was excellent, the town really made an effort despite the pretty miserable conditions. It was a real shame that the weather was so poor as bright, warm sunny conditions would have got more people out and made a good event even better. So final result was a 11 min 19 second win for the train which was a little closer than I had thought. With better conditions, I think I could certainly get closer to the train finish time but I would need a minute a mile improvement in not ideal running conditions which may be slightly out of reach to be fair. It was a good event overall and a good family day out/weekend away and well organised by the locals. It was also good to see everyone wearing their T-Shirts after the race as I spotted them several times in different places (Motorway Service stations etc on my way home. So congratulations Mr Train sir, you ran a fine race.